Every January 1 around 9:00 AM, Brent Fultz carries his camera and cappuccino up the street a few blocks, and takes photographs of the Rose Parade. Here are a few of the floats. All floats in the Rose Parade are covered entirely with plant material, including numerous fresh flowers. The cost of each float is in the range of 1e5 - 1e6 US$. A small industry exists around Pasadena to design and build these floats, and the designers have developed unique styles and construction techniques. Click below to see photographs of the floats in the 2019 Rose Parade. The theme of the parade was "The Melody of Life." The sky was blue, with light clouds. The temperature rose to about 60 F towards the end of the parade. Click below to see photographs of the floats in the 2018 Rose Parade. The theme of the parade was "Making a Difference." The sky was blue, with light clouds. The temperature rose to about 70 F towards the end of the parade. Oversize People, Animals and Things. Humor and Whimsy with Animals. Click below to see photographs of the floats in the 2017 Rose Parade. The theme of the parade was "Echoes of Success." The sky was overcast, with drizzle towards the end of the parade. The temperature was about 50 F.
Mythical animals, or big ones. Click below to see photographs of the floats in the 2016 Rose Parade. The theme of the parade was "Find Your Adventure." The sky was clear, with direct sun. The weather was a chilly 44 F at first, but warmed a bit. Outdoor animals and a dancer. People and places that are larger than life. Disney float, with Disneyland and Movies. Humorous animals and and Los Angeles. Click below to see photographs of the floats in the 2015 Rose Parade. The theme of the parade was "Inspiring Stories." The sky was clear, with direct sun. The weather was a chilly 36 F at first, but warmed a bit. Peculiar sizings of big and small things. Click below to see photographs of the floats in the 2014 Rose Parade. The theme of the parade was "Dreams Come True." The sky was mostly clear, with direct sun. The weather was a chilly 48 F at first, but warmed nicely. Honda float in five segments. Monster truck, monster plane, monster fish, and Glendade bear. Beverly Hills, band bus, cheese and crackers, wedding float. Africa, Indonesia, Singapore, rural America. K9 corps, dogcatcher, Voice, train. Click below to see photographs of the floats in the 2013 Rose Parade. The theme of the parade was "Oh, the places you'll go!" The sky was partly cloudy, with some direct sun. The weather was a chilly 50 F or so. Some images courtesy C.J. O'Hara. Brontosaurus, Teddy Bears, Forest Creatures, Dogs. Dr. Seuss, Seahorses and Carriage, Fearless Ship, Fairy House. Indonesia, Spanish Mission, Pagoda, Tower Bridge. Penguin Plane, Maxwell's Equations, Medical Research, Ship of Knowledge. Click below to see photographs of the floats in the 2012 Rose Parade. The theme of the parade was "Just Imagine." The sky was blue with wisps of clouds, and the temperature was pleasantly warm. Transportation - train, plane, carriage, wagon. Power Figures - transformers, dragons, eagle. Humorous or Whimsical - flying pigs, worm, caterpillar, idea factory. Click below to see photographs of the floats in the 2011 Rose Parade. The theme of the parade was "Building Dreams, Friendships, and Memories." The sky was clear with a few light clouds, but the temperature was cool in the 50s F. Some images courtesy of C.J. O'Hara. Dragon boats, state fair, hacienda, moviemaking. Cat, bull, rabbit, Sponge Bob. Click below to see photographs of the floats in the 2010 Rose Parade. The theme of the parade was "A Cut Above the Rest." The weather was perfect -- a few light clouds in the sky. Airplanes -- real and otherwise. Tall thin trumpeter, Venetian gondola, Folks near and far. Mythical animals and more real ones. Beautiful places, cities and under the sea. Click below to see photographs of the floats in the 2009 Rose Parade. The theme of the parade was "Hats off to Entertainment." The weather was perfect -- not a cloud in the sky. Click below to see photographs of the floats in the 2008 Rose Parade. The theme of the parade was "Passport to the World's Celebrations." The weather was beautiful -- only a few traces of clouds. Click below to see photographs of the floats in the 2007 Rose Parade. The theme of the parade was "Our Good Nature." The weather was beautiful -- not a cloud in the sky. Click below to see photographs of the floats in the 2006 Rose Parade. The theme of the parade was "It's Magical." Heavy rain fell on this parade for the first time in about 50 years. Click below to see photographs of the floats in the 2005 Rose Parade. The theme of the parade was "Celebrate Family." Click below to see photographs of the floats in the 2004 Rose Parade. The theme of the parade was "Music, Music, Music." Click below to see photographs of the floats in the 2003 Rose Parade. The theme of the parade was "Children's Dreams, Wishes and Imagination." Click below to see photographs of the floats in the 2002 Rose Parade. The theme of the parade was "Havin' Fun." 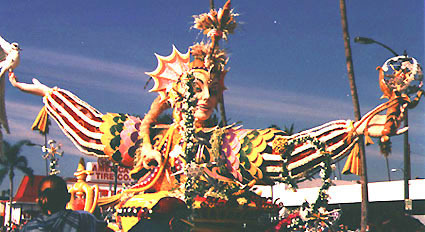 Click below to see photographs of the floats in the 2001 Rose Parade. The theme of the parade was "Fabric of America." Click below to see photographs of the floats in the 2000 Rose Parade. The theme of the parade was "Visions of the Future." Click below to see photographs of the floats in the 1999 Rose Parade. The theme of the parade was "Echoes of the Century." Click below to see photographs of the floats in the 1998 Rose Parade. The theme of the parade was "Have'n Fun." This page is offered for your enjoyment and mine. You are welcome to download the images and use them as you wish. Please consider citing this URL to give photo credit, but this is your choice.